There were lots of Star Wars jokes this week about “May the fourth be with us,” but in a time that seems like a galaxy far far away the fourth of May has a more somber meaning. Forty-eight years ago four students at Kent State University were shot and killed by National Guardsmen sent there to control anti-war protests. I was a student in 1970 at a liberal seminary 120 miles from Kent. Most of us at the Methodist Theological School in Ohio were opposed to the Viet Nam War; so we felt the pain of that tragedy from a particular point of view. Like many campuses our school was shut down after the shootings. The difference at Methesco, as we called it then, was that classes weren’t cancelled because of student protests. The Administration and faculty did it and called us all together to pray and discuss what we might do to respond to this tragedy and the animosity and anger dividing our nation. It was a time not much different than our own where America was divided over a war that had dragged on far longer and cost more lives than was acceptable. Two presidents had promised to end the war and failed, and two prominent peace advocates had been assassinated just two years before. The move that set that fatal May day into action was President Nixon’s decision to secretly expand the war by invading Cambodia. Campuses all over the country erupted in violent protests and civic and college leaders at all levels struggled with how to restore order. Tragically people died at Kent State and 10 days later at Jackson State in Mississippi where two were killed and 12 wounded. The latter never received enough publicity. Some say it was racism because those students were black, but whatever the reason the loss of life added to the whole tragedy of that decade. I want to emphasize that no one I knew blamed the guardsmen for the Kent State deaths. Those young men were about the same age as the protesters, which means they were my age; and I know I would have been scared to death in their shoes. If there’s blame to be had it belongs to President Nixon and Governor Rhoades and the Ohio state leaders who put the guard in that untenable position. But the blame game was of no use, and I’m grateful to my mentors at Methesco who helped us learn that lesson but instead helped us brainstorm more constructive responses. It’s hard to find silver linings to some clouds, but if there were any benefits from the blood shed on those two campuses one would certainly be that those deaths forced the nation to a deeper examination of why we were in Southeast Asia. I believe May 4, 1970 was a turning point in the court of public opinion that brought our involvement in that war to an end sooner than it would have happened otherwise. On a personal level that week had a profound impact on me and my ministry. The way our seminary community came together and how we responded put practical flesh and bones on the lessons we had learned academically about the imperative of the church to be engaged in social justice ministry. It was thing to study commandment to “do justice” (Micah 6:8); pleas for “justice (to) roll down like waters, and righteousness like an ever-flowing stream (Amos 5:24); visions of “beating swords into plowshares and spears into pruning hooks…and not learning war anymore” (Isaiah 2:4); or Jesus saying peacemakers are blessed (Matthew 5:9) and warning that “those who live by the sword will die by the sword” (Matthew 26:52) but quite another to apply those idealistic teachings to the nitty gritty of life and death issues. After a good deal of discussion our seminary community decided on a two-prong approach to that May 4th. Knowing that there was deep division both within the church and the political community about the war we decided to try and address both. The decision was made that a delegation from Methesco would contact a nearby seminary with a much more conservative approach to theological and social issues to see if a dialogue between the two schools could help us both understand the other’s point of view. I was not part of that group so I don’t remember any particulars of what came from that discussion. The other approach was for a group of us to travel to Washington DC and see if we could meet with Congressional representatives to express our concern and desire for peaceful resolutions of differences both within our nation and in the international community. We were young and poor then and full of energy; so three of us decided to save time and money we would drive straight through that night to DC, meet with whomever we could during the next day and then turn around and drive home the next night. I can’t even imagine doing that today, but it turned out to be one of the best bonding moments of my seminary career. The two guys I shared that 24-hour adventure with are still two of my best friends 48 years later. We did meet with some representatives but came away feeling those men were much more concerned about protecting campus property and establishing law and order than they were about the human costs of the war or the issues the protesters were trying to raise. That too was a good lesson in patience and practical theology. Change and solutions to complex social issues do not happen overnight. Prophetic social justice ministry requires persistence. The issues change in each generation, but the need for people of faith to engage in relevant, messy, controversial issues never changes. There is always a need for the church to speak truth to power because the haves very rarely are willing to share their power with the have nots. The three of us who were punchy and sleep-deprived when we completed our 24-hour marathon those many years ago are still active in retirement trying to discern God’s word for our day and trying as best we can to address social justice issues. May the force of truth and justice always be with us. 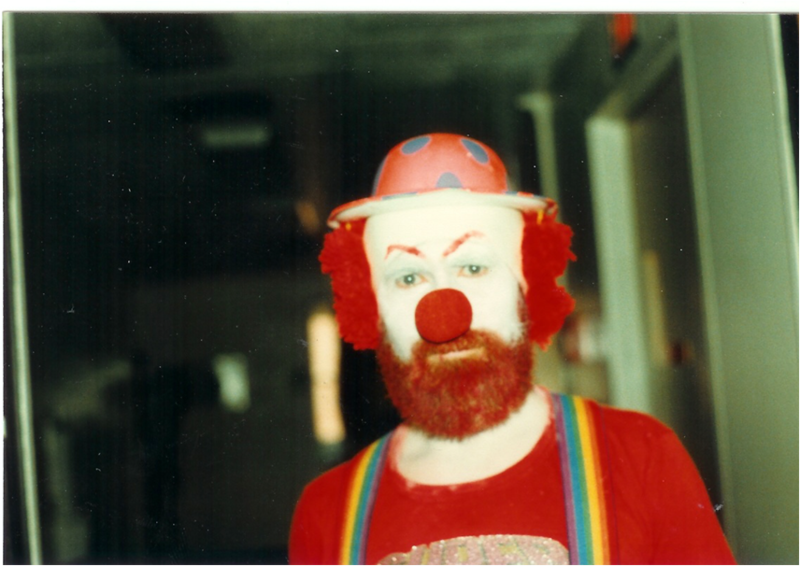 When I saw the preaching schedule said I got to preach on being fools for Christ my first thought was, “I’ve been typecast!” Then I came across this old picture of me in my youth ministry days and thought, “OK, I guess the shoe fits.” But seriously, why would Paul advise us to be fools? Do you know it says in the Bible, “There is no god?” It really does, and that particular verse is a great reminder that we cannot pick and choose things from the Bible and take them out of context. Psalm14:1 is where it says “there is no god,” but if you read the whole verse you discover it says, “Fools say in their hearts, ‘there is no god.’” That’s obviously not the kind of fool Paul wants us to be. “We don’t necessarily discriminate. We simply exclude certain types of people.” Colonel Gerald Wellman, ROTC instructor. “Your food stamps will be stopped effective March 1992 because we have received notice that you passed away. May God bless you. You may reapply if there is a change in your circumstances.” Dept. of Social Services, Greeneville, SC. That’s not the kind of fools Paul is talking about either. Verse 18 says “Do not deceive yourselves. If any of you think you are wise by the standards of this age, you should become “fools” so that you may become wise.” Come again Paul? How does one become wise by becoming a fool? That seems pretty foolish. The Interpreter’s Bible commentary explains some of the confusion this way. Corinth, because of its geographic location was a very cosmopolitan city. Corinth, sitting in southern Greece and just across the Aegean Sea from modern day Turkey, was on the major trade route between the eastern and western parts of the Roman Empire. It was therefore made up of a diverse population and affected by a variety of religious and secular ideas. Among the key influences was the Greek philosopher Diogenes who taught that the “wise are friends of the gods and gods own all that is. Therefore the wise have access to everything.” It was an early version of what today is known as the prosperity gospel, namely that if we believe the right things we can expect God to reward us with material prosperity. It’s a favorite theology of those who start out to do good and end up doing very well. By contrast Jesus taught the exact opposite, that “it is easier for a camel to go through the eye of a needle than for someone who is rich to enter the kingdom of God,” and that we shouldn’t “store up treasures on earth where rust can consume and thieves break in and steal.” That’s not the kind of wisdom we hear from our financial advisers and retirement planners now is it? As I read this text over the song that says “Fools rush in where angels fear to tread” kept coming to mind. But we have to give Paul credit. He practiced what he preached, getting imprisoned for his faith several times and once even refusing to escape from jail when he had the chance. He, like many martyrs and visionaries seemed to be a fool himself by challenging the wisdom of the world. In the church at Corinth Paul felt it necessary to do that because some of the members in that church were becoming arrogant and feeling self-important. Some who had particular spiritual gifts thought they were better than others who didn’t have the same gift. Paul addresses that specifically later in I Corinthians chapter 12 where he compares the church to the human body that needs all of its parts to work. And no one part is more important than any other. When we are not self-aware it’s too easy to act irresponsibly. Instead of doing what we know to be right or stopping to think about that, we just go along with the crowd. Someone said recently that he was glad he grew up before cell phone cameras were everywhere because he did a lot of really stupid things in his youth and there’s no record of any of them. At its worst those who are not blessed with self-awareness can fall prey to what’s known as mob mentality. That can lead to horrible actions that most people would never do on their own but will when we lose our sense of self in the anonymity of a crowd. The violence in Charlottesville is an extreme instance. An example on a less dangerous scale is the term “fan” we use to describe a sports team’s followers. The word “fan” is short for “fanatic” and we’ve all seen or been one of those kinds of fools who get a little too carried away with team spirit, or some other kind of spirits. My family hated to sit with me at my son’s high school basketball games because for some strange reason they thought expressing my displeasure with the referees was embarrassing! Without moral responsibility we lose track of our values and priorities. Like Pastor Chris said in last week’s sermon our own personal goals and bucket lists can become more important than doing what is right and good. I grew up a huge fan of the Cincinnati Reds in the days of the Big Red Machine. I suffered with them through two World Series losses to those darn Yankees and the Oakland A’s. And then in 1975 they won it all in one of the best World Series ever against the Boston Red Sox, and I thought my dreams were fulfilled. The Kingdom of God could come now. Somehow I expected things to be different because of a silly game played by overgrown and over paid kids. Of course it didn’t change anything. There’s even a lesson we can learn from something as scary as the nuclear game of chicken going on with N. Korea. We’re all praying for a peaceful solution to this problem, but it’s a reminder that in the worst case scenario if there is a nuclear attack anytime we won’t have days or even hours to get our moral house in order. We need to be right with God all the time, even when it makes us look foolish in the eyes of the world. Let’s not sugar coat it. To be a fool for Christ can be lonely. I was a Boy Scout all through Jr. High and high school, and it was a great experience. But I have to tell you I dreaded Boy Scout week each February because it meant we were supposed to wear our scout uniforms to school. It wasn’t cool to be a boy scout. The same thing happened when I got my call to ministry at a church camp my sophomore year in high school. It took me 3 years before I told anyone about that because I was afraid people would think I was some kind of goodie two shoes. We all know bullying is a major problem for kids these days. Being a Christian fool means doing something to stop a bully, whether it’s intervening directly or getting a teacher or other adult to address the situation. There was an incident in Portland, Oregon recently where a man was yelling racist and anti-Muslim threats at two women on a bus. Three other passengers intervened and two were killed and the other wounded when the bully pulled a knife on them. What they did to put ourselves in harm’s way might seem foolish to the world, but the harm to one’s conscience when we fail to do the right thing is much worse. That’s an extreme case of course, but it illustrates the seriousness of Christian discipleship. And then the violence in Charlottesville happened yesterday, and the risks of standing up for truth and justice were written in bloody broad strokes for all of us to see. There’s nothing funny or silly about being a fool for Christ. Christian fools pay a price for their faithfulness. John and Charles Wesley who started the Methodist church were thrown out of the Church of England because they challenged things in that church that they believed were wrong. Worldly values would call Mother Theresa foolish to go live among the squalor and disease in Calcutta, but we call her a saint. I am so proud to be part of this congregation for all the foolish things we do. Worldly values often base decisions on what the ROI will be of a particular action. ROI stands for Return on Investment. By the ROI standard Northwest Church does a lot of foolish things. Our Kairos ministry shares the Gospel and delicious cookies with prisoners at the Marion Correctional facility several times a year. None of those men are likely to ever darken the door of our church. Where’s the ROI for the time and effort that goes into that ministry? We send food and servants down to Broad St. UMC to serve meals to hungry and homeless people at the Manna Café. We even have some wonderful servants who get up very early some Sunday mornings to serve breakfast to hungry people at the Church for All People. None of those folks will ever contribute to our church’s bottom line. Where’s the ROI? Same thing with Brown Bag Lunches and back packs filled with school supplies to kids in our own backyard. It’s unlikely that most of those people will come and sit in these pews so our attendance numbers look better for the bishop. The world operates on a profit motive, but the church runs on a prophetic model. The world says “what’s in it for me?” Christian fools say “what’s in it for others?” Our ROI is the warm feeling of having done something good for one of God’s children. It’s seeing the joy and pure delight on the faces of hungry kids receiving their brown bag or backpack; watching them run out to meet our church van because it shows them somebody cares about them. The wisdom of the world is self-centered. The foolishness of the Gospel says those who love must be servants of all. Christians are called to always reflect love and grace, not judgment and exclusion. I learned a simple prayer in a seminar on peacemaking a few years ago. It really helps when I remember to pause in a tough situation when it is so easy to lose my temper. It’s simply to repeat to myself these three phrases: “Let me be peaceful, let me be kind, let me accept myself and others as we are.” That’s really very hard to do, and I often fail miserably; but it’s what we are all called to do and be by the biggest fool the world has ever known. Instead Jesus said, “Father forgive them, for they know not what they do.” And then, “Father into your hands I commend my spirit.” The wisdom of the world thought it had triumphed on Good Friday. Jesus’ mother and disciples grieved the death of Jesus and their hopes for the future. But on resurrection day God got the last laugh. It was never between you and them anyway.” Amen.